So said Father Ernest D. Sillers, the late Episcopal priest known as much for his tireless advocacy of service and education as his religious commitment. It was Sillers’ grand vision – to create in Orange County a string of schools strong in academic and moral development, with an emphasis on values – that set in motion the founding and natural expansion of St. Mary’s School. 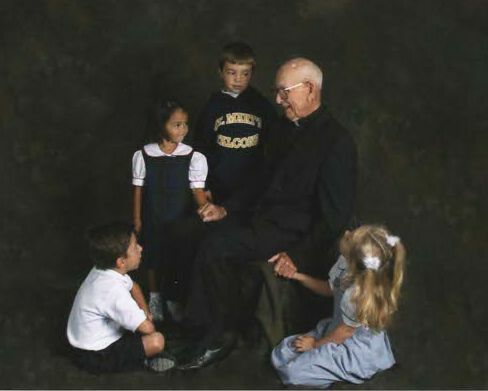 Father Sillers referred to St. Mary’s (his fourth school, opened in 1994 with only four classroom trailers) as the Jewel in the Crown for good reason; it was the first of his schools to be non-church affiliated and, in his words, “most in line with the world.” Including all faiths in a school that defines itself within the trinity of integrity, academics, and spirituality, he believed, is the best way to prepare youths for the inevitability of a more globally-connected world… one that is intellectually diverse, interconnected by technology, and perennially in flux. His dream was to turn students into world citizens who, when tested, would find strength from their St. Mary’s foundation. Father Sillers’ ambition matched those of parents everywhere, and in its 20 plus year history, St. Mary’s has attracted droves of multi-lingual, religiously diverse, international families. His vision also matched that of the International Baccalaureate (IB) World School Organization, and in 2007 St. Mary’s became the first and, to this day, the only private school in Orange County to incorporate the IB curriculum for preschool through eighth grade. The palpable pride within the St. Mary’s community stems directly from this clarity of purpose: academic excellence, with compassion… for a better world. With a rich history and a strong family community, St. Mary’s is now under the leadership of our third Head of School Sharon Taylor. As the first and only private early education through middle school in Orange County to offer the IB Programme, St. Mary’s promotes critical thinking while focusing on developing skills to meet the challenges of the ever-changing world. Centrally located in the foothills of Aliso Viejo with vistas above Wood Canyon, St. Mary’s has achieved regional acclaim, attracting students from more than 11 cities in Orange County from the coastal communities of Newport Beach down to San Clemente and inland from Irvine to the foothills of Trabuco Canyon. Our approach to education is both aspirational and goal-oriented. We take education several steps further by providing a trans-disciplinary curriculum with high academic standards, coupled with a strong athletics and arts program. At the heart of the St. Mary’s experience is a values-driven atmosphere that helps children to become caring, compassionate individuals who are not just critical thinkers, but young people who take ownership for improving the world.